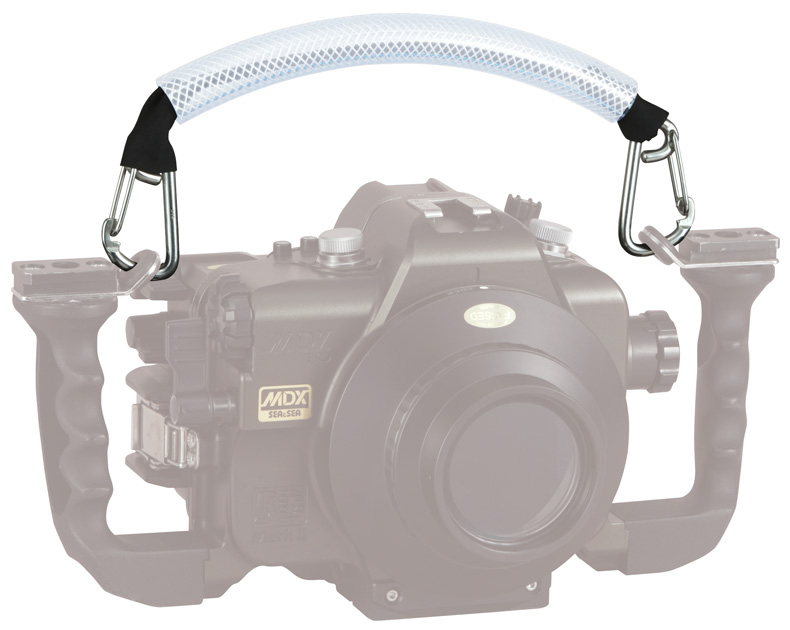 Multipurpose float that can be used as a buoyancy-arm and as a carry handle. Available in three colours (black, yellow and pink). *Colours of the Buoyancy-Arm Handle may differ from the colours shown in the brochure. The optional SA8 Fixed Ball Base Mounting Hardware Kit can be used to fit two SA8 Fixed Ball Bases to the Buoyancy-Arm Handle. This allows you to use the handle as a strobe buoyancy arm or adapt it to your own ideas. *Weight on land and underwater buoyancy of individual handles may slightly differ. Used to clip the handle to the housing for use as a carry handle. *Four rubber rings are included with this kit. These prevent the metal lanyard loops from contacting each other directly to reduce noise. Used to mount two SA8 Fixed Ball Bases to the handle for use as a strobe arm. *Two SA8 Fixed Ball Bases will be mounted with one kit. New lanyard for carrying SLR housing. The clips have been designed to prevent accidental release. Rubber covers reduce noise for videography. Can be used with all MDX series housings and other SEA&SEA housings mounted on the Grip-Stay L II. For MDX housings for mirrorless interchangeable lens cameras.